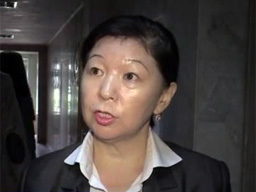 BISHKEK (KirTAG) — Zuurakan Kadenova, who arranged a riot at the Seoul airport, was dismissed from the post of Deputy Minister of Labour and Social Development of the Kyrgyz Republic. The press service of the Kyrgyz government reports on Saturday. “The Prime Minister of the Kyrgyz Republic Muhammadkaliy Abylgaziev signed an order according to which Z. Zuurakan Azhimatovna Kadenova was dismissed from the post of Deputy Minister of Labor and Social Development of the Kyrgyz Republic”, the press service of the Prime Minster informs. Deputy Minister of Labour Z. Kadenova arranged a scandal aboard an airplane that followed the Seoul-Almaty flight from the Incheon airport in Seoul. For two hours flight attendants tried to get the rowdy from the plane. However, she refused to obey. Then the plane commander decided to withdraw all the passengers. According to eyewitnesses, Mrs Kadenova was drunk.